Pyeongchang: The figure skating ice dance gets underway with a young French couple snatching the favourites mantle while anti-doping authorities report on a new suspected doping case involving a Russian athlete. The Pyeongchang Olympic Games is in its second week and already faces a second doping scandal. This time a Russian athlete, Alexander Krushelnitsky, in the curling event is the focus of suspicions and the outcome of the case surrounding the banned substance meldonium is expected later in the day. Russia was banned from the Games in December over a state-sponsored doping conspiracy but 168 'clean' athletes from the country were allowed to take part. Taking centre stage in the figure skating ice dance are a young couple from France, Gabriella Papadakis and Guillaume Cizeron, who have shot to prominence following a string of stunning pre-Games exploits. They are up against Canadian duo Tessa Virtue and Scott Moir who won gold in Vancouver in 2010 and took silver in Sochi four years ago. The contest promises to be compelling. After nine days of competition women's hockey players are finally reaching the business end of the Olympic tournament. It is semi-finals day and the USA play Finland while defending champions Canada face Olympic Athletes from Russia. A USA vs Canada final could be on the cards. Defending champion Maddie Bowman of the United States is one of the favourites among the daredevil acrobats on display in the women's halfpipe. Bowman has promised to unleash a new bag of tricks in her bid to retain her Olympic title. Japan's world champion Ayana Onozuka is among a group of strong challengers. World champion Jan Smeekens leads a strong Dutch challenge and hopes to finally realise his lifetime ambition of winning an individual Olympic gold medal. 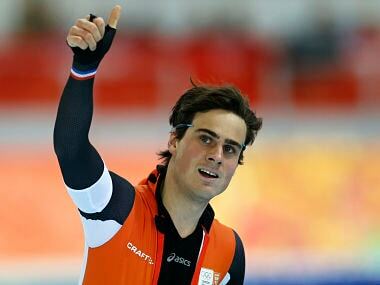 Smeekens, 31, took the silver medal four years ago and will be pushed hard for gold this time by current World Cup leader Havard Lorentzen of Norway.